As a suppler of highly reliable lithium cells Tadiran has developed an enviable reputation for quality. Tadiran cells experience an exceptionally low self discharge rate with gives them an exceptionally long shelf life. 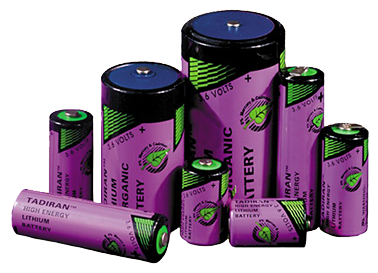 In fact, Tadiran lithium batteries have been proven to last up to 40 years. This makes them ideal for a wide range of applications, particularly those where it is not viable to regularly change batteries. We use Tadiran lithium thionyl chloride (Li-SOCl2) cells in a number of our primary battery packs where high energy density, long cell life and tolerance to extreme temperature is required. Many Tadiran cells are able to operate in temperatures ranging from -100°C to +125°C. Further information relating to Tadiran cells can be found by visiting the Tadiran website.